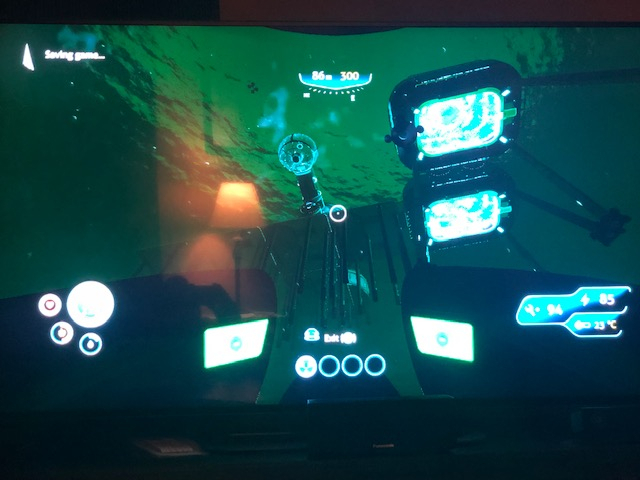 I was exploring a fairly dubious cave system in the Blood Kelp biome when I decided I should probably save before I inevitably get myself stuck. That turned out to be a mistake. The spinning save animation never went away, which I knew was a bad thing. But just as bad, when I managed to exit the cave system and go back into the open world, I realized the world had completely stopped rendering. 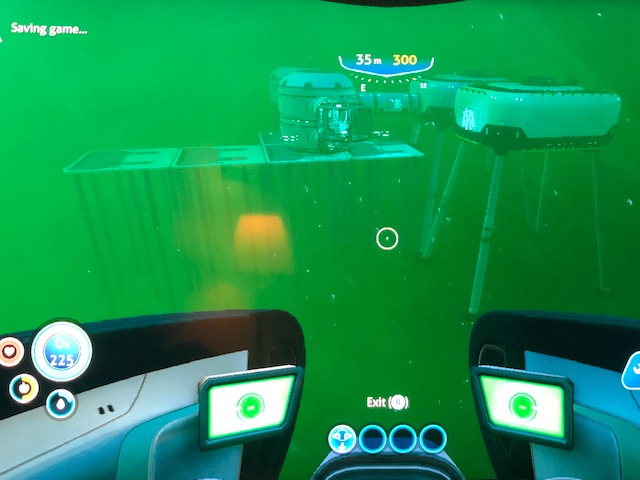 I went to the surface to avoid getting trapped in the map geometry in case it decided to appear (it didn't) and made my way back to my base, which is where I took the photos below. My base is located on the border of the shallows and Kelp forest, which is why one is green and one is blue. 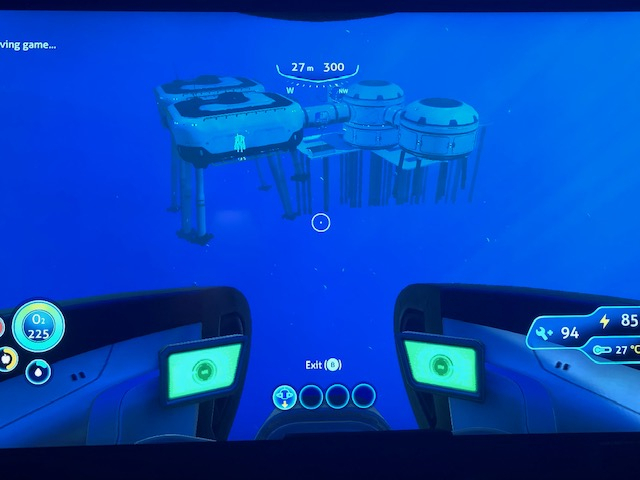 If you go on one side of the base, it has the green filter effect of the kelp forest. Then if you go on the other side, it has the blue filter of the shallows. Obviously, nothing else rendered besides the base itself. There should be a cliff, plus some dense kelp foliage all around the base (I picked the location because it looked cool). And, you know, some ground, maybe. As you can see, the save animation was still going even after the 2 minute trek back to my base. I let it go for another 20 minutes and it never stopped. I eventually had to kill the game from the Xbox OS, which is where it gets even worse. Now, my game won't load at all. I get the opening splash screen, but the game menu never loads, essentially meaning the game is a glorified wallpaper for my Xbox. I'm guessing (read: hoping) that uninstalling and reinstalling will fix it. If it doesn't, then that's probably about it for my time with Subnautica. I have other games I'm about ready to move onto, and don't really have the desire to start from scratch all over again with this one. I know everyone complains about never having enough copper and I currently am working on a project that will require a lot of it. I’ve searched all the places that the wiki says has large copper deposits but I still haven’t really found enough. What’s the best way to farm copper? Finally was able to recover my saved file last night by completely unplugging my Xbox. So that's good. Downside was I made my way into the Lost River for the first time. Lag there was pretty bad. Don't hold your breath we've been begging for months for even something as simple as consol commands to make up for prawn suits randomly falling through the world. We're getting closer with a new console patch. We'll be re-enabling some dev options which may help those who are stuck. ...I made my way into the Lost River for the first time. Lag there was pretty bad. I know what you mean! I reached the Lost River on XB today and the lag there is awful. Not sure why. I was going to get this on PlayStation 4 but now I’m not so confident?